Let me start off by saying we've done food walking tours in 6 other cities of Europe, so we've had many different experiences, but this one probably took the cake for worst tour we've ever done. The tour started off in a great little spot of Naples but was really all downhill from there. Our group was just 3 people my wife, myself, and another guy. The first spot was a random pizzeria which looked like a typical tourist spot where our guide said she'd let us just be while we ate--though admirable, we just met this guy 5 minutes earlier and the first rule of tour guides is to provide a glimpse into the food, culture, and life of a typical Neapolitan. 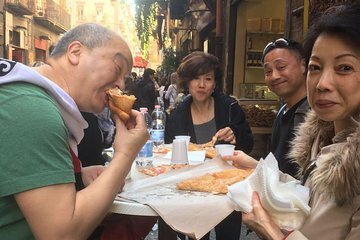 Instead the 3 of us waited alone outside for 40 minutes to get our ordinary pizza without being given any insight into the history of pizza in naples, how pizza is made, how typically eaten knife and fork vs by hand vs folded up, or what they typically drink with it beer, not wine. After finally being served the pizza, our guide came to collect us approx 15 minutes later...so 50 minutes into the tour we've stopped once and have been alone the majority of the time. I could get into the overall detail but I'll share a few other things that just made this tour ridiculous: 1 She repeated this 'leave us alone' at an osteria for a traditional pasta dinner again 35 minutes or so 2 one of the things she told us to look for was not going to restaurants with their menu posted in 3 languages 2 or less is fine, but 3 or more is just a tourist restaurant--what did the osteria have posted right in front that we noticed and then asked after we ate? A huge menu in 3 languages! 3 Though the highlight if there was one was the buffalo mozzarella at a tiny counter bar next to Sorbillo, after a few other non-eventful stops we literally came back to the same counter bar for a limoncello... again, no insight into why the limncello is so important to southern italians. 4 The majority of the tour seemed focused in a very small area, which in and of itself is not a bad thing, but it didn't feel like the tour really went through the best of naples, rather focused on a busier street or two. This review is not a reflection of the tour guide--she was very nice, but rather the tour is just organized very very poorly. Don't leave your guests to eat, your job is to host, create conversation, and give us a glimpse into their life in Naples.